It’s almost time for CRMUG Summit 2018! Are you registered yet? Whether you’re planning to register soon, or are already registered, you won’t want to miss Ledgeview’s educational session, “From Lead to Opportunity – Defining Your Process”. Once you are registered, you can add this session, among many others from Ledgeview, before you go. Simply navigate to CrmugSummit.com/CRMUGSummit/Schedule/Sessions to get started with scheduling your sessions. 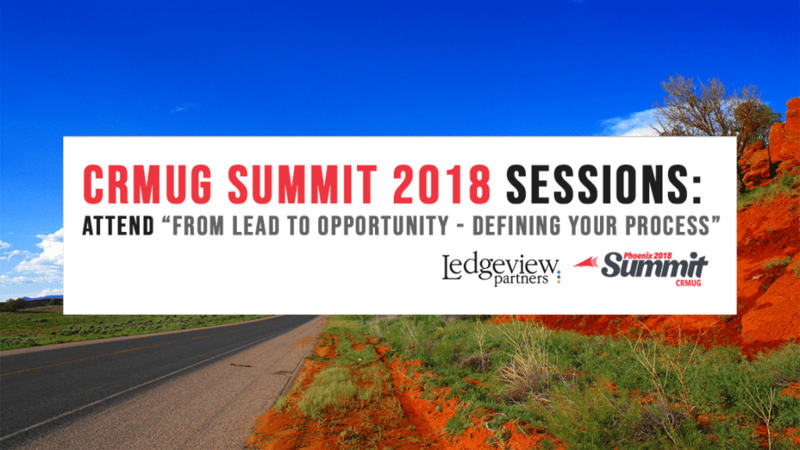 Ledgeview will be presenting a total of six educational sessions during the CRMUG Summit this year. If you want to know more about the benefits of defining your process from lead to opportunity once you implement CRM, whether you’ve had it for a few months or years, you won’t’ want to miss this session. Learn where these definitions stem from and how they can benefit everyone involved in the CRM process. Though it may seem complicated to you now, Ledgeview will clear things up and help you see the simplicity of defining leads and opportunities within your unique organization! Join us on Tues. Oct. 16 at 8:15 a.m. at Location 223 for this session. If you’ve yet to register for the CRMUG Summit, save 10% on your tickets with the code “PRPLedgeview” and register here. We look forward to seeing you at our educational sessions and throughout the summit at Booth #434.